Quick Summary: Radiohead finally returned to music after disappearing for a while because of the media intrusion over OK Computer. Their new album, Kid A, was to be a very different sound. Out with the guitars, in with keyboards, and sound loops. About 3 weeks before Radiohead were to release this 'difficult' album, all the tracks were leaked onto Napster. It became one of the most downloaded bunch of files ever. Yet, Despite all this, and despite Radiohead's policy on not releasing any singles or videos to promote this album. Kid A shot straight in at #1 in the UK album charts. It also gained the #1 spot in the US charts, which was a first for the band. 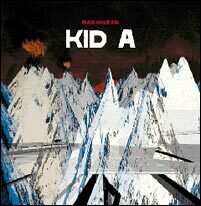 Kid A appeared just over 3 entire years after their previous LP. A long time to make one album. But because of the massive media exposure which resulted from OK Computer, Radiohead had hidden themselves away for a while. During this time, Thom was having a hard time coping. He couldn't write anything anymore and the new disc had no direction. Posed with the question "What do you do after creating arguably the best CD in the world?" He apparently had no answers. The band had made the decision, rather than to carry on rehashing what their previous album had built for them into endless albums of the same sound. They were going to create something entirely different in every way. Thom even wanted to go as far as changing the group's name to something else. Nigel Godrich played a big part in Kid A's production. He has a great skill for putting music together, and Kid A was primerily put together on computer from separate sounds the band had created. Unusual to a band who records all their music by sitting in a room and playing live while a tape catches it all. For the release of Kid A, everything was going to be different. The band decided that there would be NO SINGLES, NO VIDEOS and NO WORLD TOUR. Thom even pulled lyrics out of a hat, rather than giving them meaning to his songs. Only one album, and that was all. After 3 years of waiting, releasing one album which completely changes your style as well as the style of bands releasing music. You're giving yourself a hill to climb. But Kid A went straight to number #1 in both the US and UK charts. Even though all the tracks were available on Napster about a month before its release, too. Radiohead went on a small tour of a few British venues. As well as one or two appearances in America. But that was all. Changed too, was the way they played gigs. No more outdoor venues filled with advertising slogans. They decided to bring their own gigantic tent along and play on open fields where they could be free from advertisers. For Kid A, everything changed. And the reviews are split straight down the middle as to whether it was good or not. Yet they pulled it off. Kid A was largely accepted by the public as a great album. "It was necessary to go away and glue back the pieces. In a way in order to survive we had to stop being answerable"
Radiohead admitted that trying to improve on OK Computer may well be useless. And though they could probably carry out their entire careers producing the same old music, that wasn't the road they wanted to go down. Instead, they've made Kid A so different to previous works, that it cannot be compared to them. It's different. You cannot compare an electronic album to a rock album. And if you do, it's unfairly. This album is again, great. Only ten tracks this time around, and one is a musical. A lot has changed, but the one thing that has remained the same is the most vital of them all. Radiohead's ability to create great music. It might not be guitars, and the lyrics might make about as much sense as the man at the end of the Just video. But it's still great music. It demands patience and time to be fully appreciated. You can't stick this on and then go and play your PlayStation. You're missing the point. Kid A must be listened to alone, with headphones, with your eyes closed and you doing nothing. Only then can you appreciate the intricate detail of even the most difficult, and strange tracks. The first time I heard In Limbo I was ready to concede that, despite Kid A having a few decent tracks, Radiohead had made a big mistake. It just sounded so rushed and random. Now I think In Limbo is arguably the best track on the album. I'm a massive Radiohead fan, and even I had my doubts about Kid A. Give it time, trust me... What's there isn't going to jump out at you. But once you find it, you'll see how good it really is.